I see many times artworks where a placed object just doesn't look real and it's alien to its environment. One trick to make it belong is to add shadows and colored lights taken from the environment to your object. 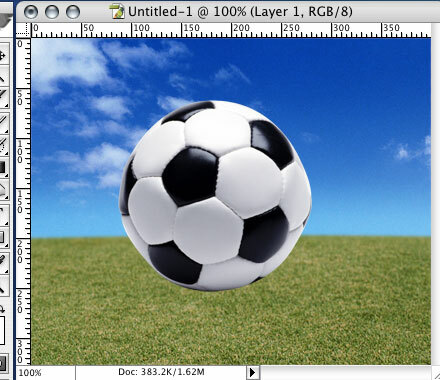 In this example we are going to put a shadow on the grass and add green and blue highlights on the ball to make it look more realistic. Make sure the light on the object matches the position of the shadow. In this case the light is coming from the top and slightly right corner, so the shadow should fall in the bottom and slightly off to the left from the ball. To make the shadow I created an oval selection, gave it a feather and made an Brightness/Contrast adjustment layer over the background and below the object. Depending on how close you move the shadow to the ball the perception of distance of the ball from the ground will change accordingly. To add the green light on the bottom of the ball I made a big oval selection over the ball containing the ball except a small slice from the bottom. I applied a feather to make the edges of the selections smoother and inverted the selection. 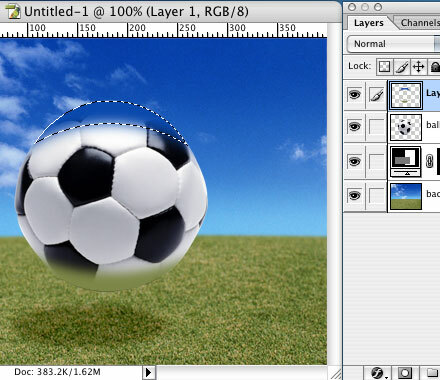 Now just press Shift-Alt-Apple and click on the layer of the ball to intersect our selection with the selection of the ball. This way we got a selection that is a slice of the ball, but with soft edges on the top part. Now that we have our correct selection we just need to create a new layer. pick a color from the grass and fill the selection with that color. 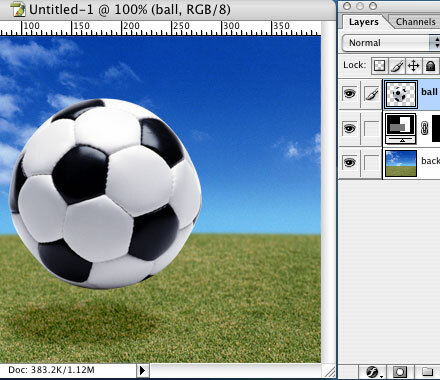 Now repeat the same procedure for the top of the ball with a sky blue color. 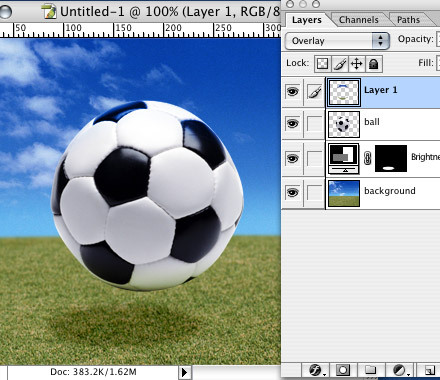 Once you have the layer with the two colored spots, you just need to change the layer from Normal to Overlay mode. This procedure is only a slight change of the image but adds a lot to reality. If there are several objects close to each other make sure you make reflections from each object to the other. If your object is shiny, like for example a bowling ball, you can even copy the sky to make it look like it's reflected on the top of your ball.